Is this the front or back view of the house? This is all the front view. 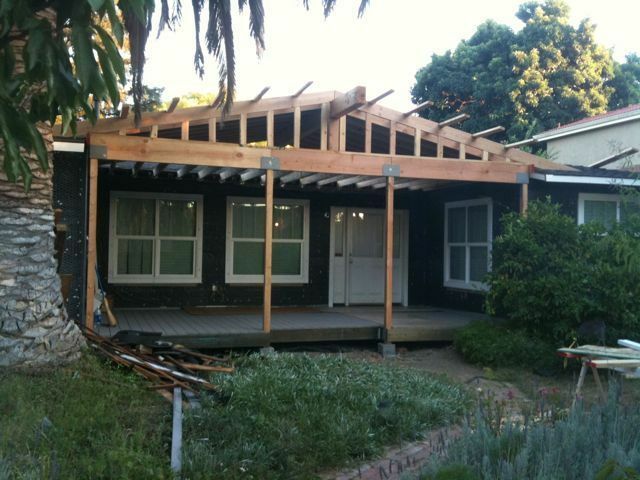 Our new front porch will be useful as a room in its own right. Thanks for the clarification. I know that people in different parts of the country use different words for the same thing. I was confused by it being called a deck instead of a porch. Where I’ve lived, deck is typically an uncovered structure on the back of the house. When I saw this one covered like it was, I thought, “Oh, maybe this is what I would call a porch – covered and on the front of the house.” A “rose” by any other name would smell as sweet and will be as delightful a place to sit. It looks nice; good work. Dude, you’ve got a palm tree! I called it a deck because it’s made of decking. It is indeed covered, and on the front of the house – so, perhaps it is a porch!